Timewatch cloud time and billing and project billing systems deliver both cost effective off-the-shelf solutions, as well as a totally customizable time recording and billing system that can be perfectly customized to meet your specific needs. Time tracking also supports outlook timesheet entry. 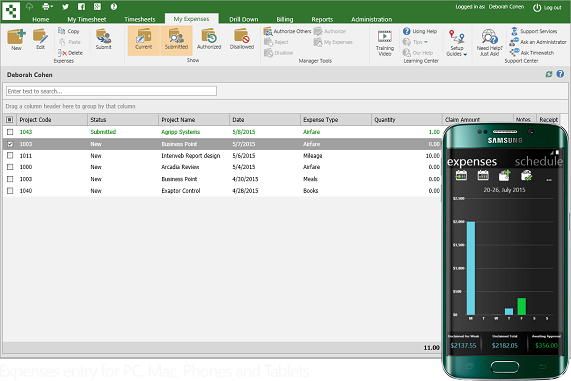 Time®&Money lets your users track time and expenses in whatever way they prefer: from a PC, Mac, phone, tablet and even from within Outlook! Timesheet entry within the time and billing system is so intuitive and easy to learn that no training is required. With time saving features such as instant search, import from calendar, and post appointments & emails from Outlook, our timesheets typically save employees between one and three hours per week and pay for themselves in minutes. Easy manager approval and alerts save administrators even more time. Powerful rating systems allow customers to match their commercial rules, with rates by person, customer, project, date, type of work, or any combination you may require. Flexible rates makes time and billing simple, easy, and accurate. Time and billing systems from Timewatch are available in the cloud and for installation on your servers. 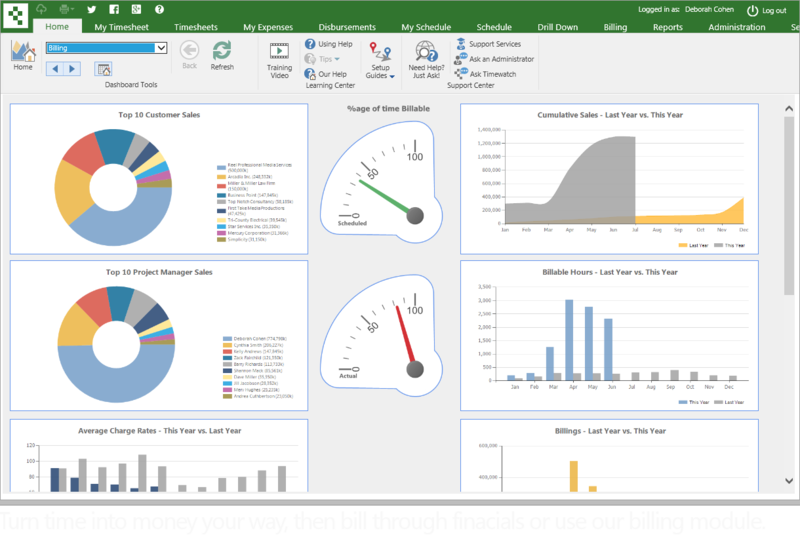 Time and billing allows you to convert timesheet information into costing and charging data for billing to financial systems. To value time accurately, you need cost and charge rates that accurately reflect the way you value time. There are many variables when it comes to valuing time. Do you value time by hour, day, or some other value? Do you value that time by employee, by project, by employee on each project, by customer, by date or some combination? Most systems limit you to a handful of rates, forcing you to compromise on how you value time and charge customers. Not Timewatch®. Our system supports unlimited rates by any combination of employee, project, customers, type of work, role, or date. Our rates are stored to six decimal places to cater for any rating period. We also support multi-currency rates. Simply put, we allow you to turn time into money the way that you want. You’d be amazed at the horror stories we hear when we replace timesheet systems. Customers often complain about the lack of reporting power in their old system. We believe if you enter data, you should be able to view it however you want. We’ve developed reporting to be one of the most powerful features of Timewatch® products. As a standard, all of our products include traditional reporting with a library of reports and features including export to Excel, Word, PDF, and email. 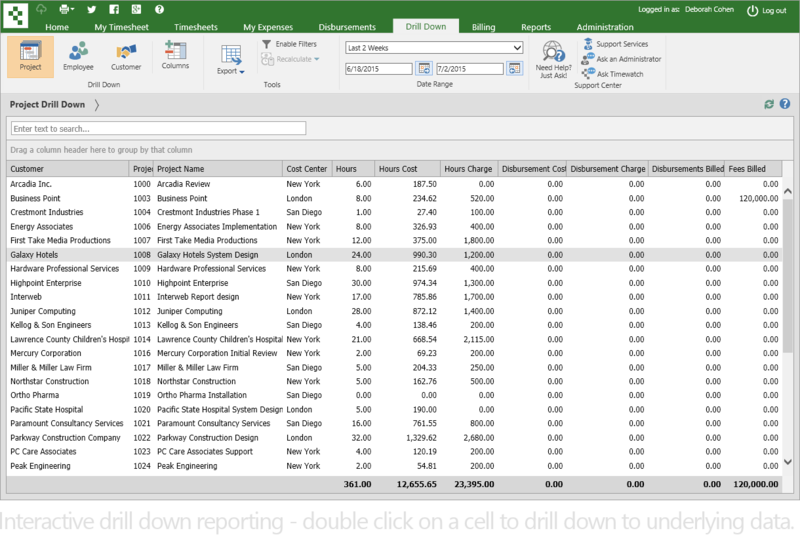 Also available are our unique drill down reporting tools, dashboards, auto alerts, and custom reporting options. More: Time®&Money is expandable with advanced modules including: Advanced Rating systems, Billing, Multi-Currency, Custom Fields, Custom Reports and more. 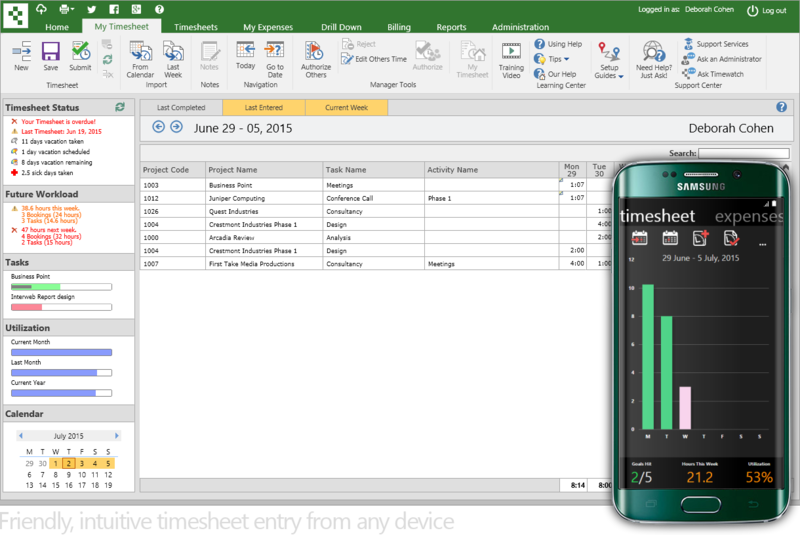 Less: If you don’t want billing or want simpler timesheet entry, take a look at Time® and OutlookTime®, which allows timesheet entry via Outlook.